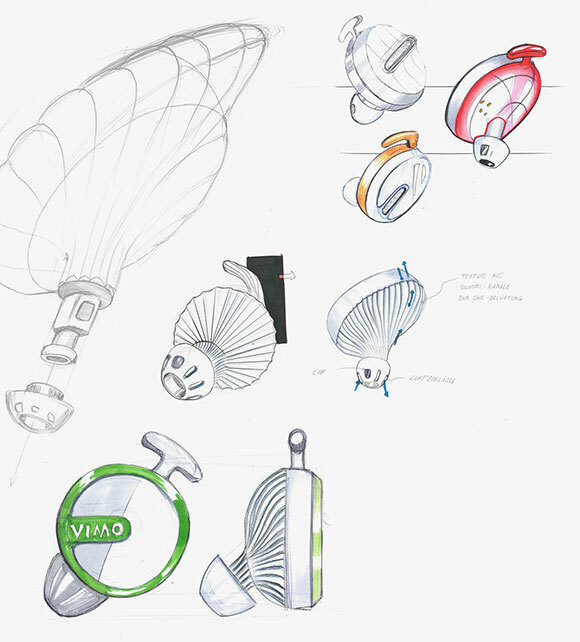 Two junior designer start the same mission: creating a functional, aesthetic and discrete design for In-Ear-Wearables. As identical as the initial position is, the concept results are entirely different. For the cooperation project of WILDDESIGN and CiS, Institute for Microsensoric of Erfurt, we sent Luca Nisi, student of Product Design at the university of “Gestaltung Schwäbisch Gmünd”, and Industrial Design student Albert Ibragimov of the Bergische University of Wuppertal. 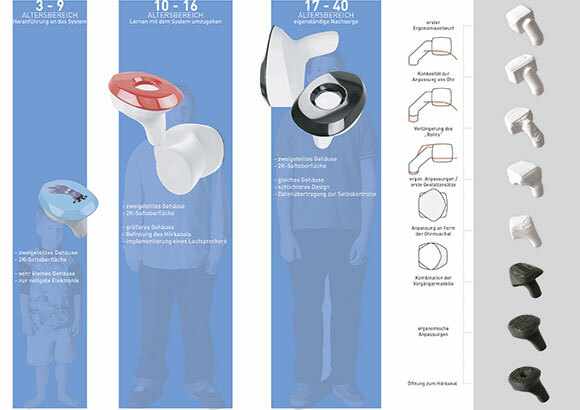 Who offered the better concept for the organization and implementation of the technology for In-Ear-Wearables, developed by CiS? 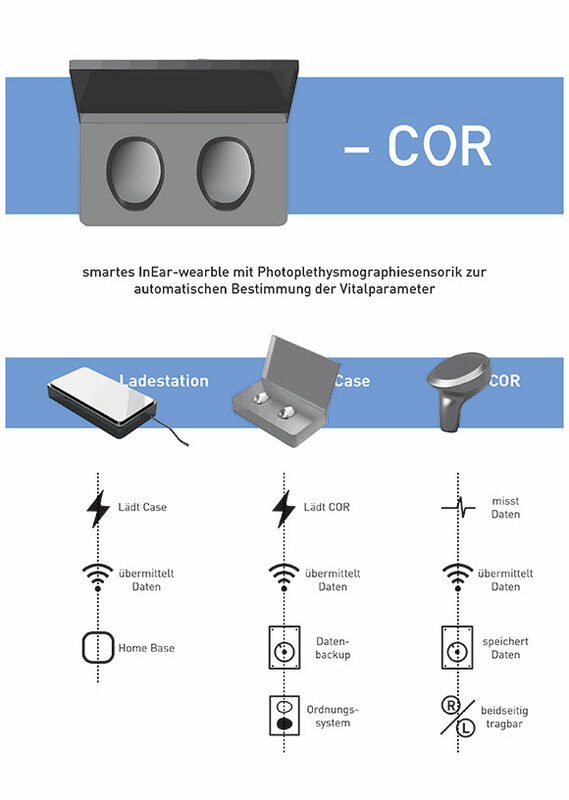 In Erfurt a sensor has been developed, which is particularly small and can measure several vital parameters due to the photo plethysmography procedure (PPG): the heart rate and heart rate variability, the oxygen saturation (SpO2) in the blood and the blood pressure. 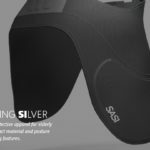 New and because of that especially interesting about the sensor technology is being able to draw conclusions to the blood pressure. So far, this has never been possible before in the form of an optical procedure. Hence, the technology has obviously improved, however a productful argument was missing for the sensor system, in order to start the product development in the future. At the moment, CiS is researching how to measure the various vital parameters (blood pressure, oxygen saturation SpO2, heart rate/heart rate variability) as precisely as possible so they can be used reliably in modern medicine. In cooperation with a HNO specialist, the research institute could constitute a place in the auditory canal, which is planar for many people and thus can be used for a continuous PPG measurement with high signal quality. An important milestone in the development of technology, since thereby more precise measurements will be possible from now on. The ability to precisely determine vital parameters gave us an innovative technical basis to build on for our project. To assure further development of the project was the task of the product designers, where they had a free choice. 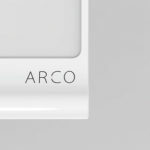 Goal was to create two strongly different drafts – even in the conceptual range: How different can products be conceived, although they have the same conditions? 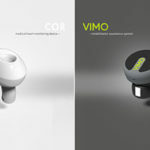 The In-Ear-Device, called VIMO and developed by Albert Ibragimov is a speech assistant who can give a patient with (for example) COPD or asthma instructions for breathing exercises while measuring their vital parameters. The user will be individually challenged during the training in order to prevent overexertion and difficulty in breathing. Simultaneously the data will be recorded and available as diagnosis for the doctor. In order to note particularly arduous events, such as climbing stairs or heavy lifting, the patient can record a voice message on the device which allows the doctor to get a better understanding of it and assign problem situations. 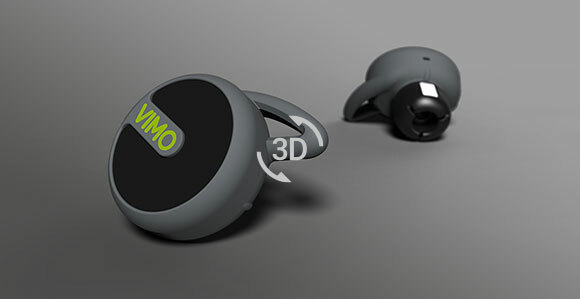 The In-Ear-Device measures the vital parameters and provides language statements as exercises for the user at the same time. Besides the In-Ear-Device, the full package contains a mobile and stationary charging case and App. The app visualizes the exercises by means of a virtual coach and stores statistics. The mobile charging case is there for loading the In-Ear-Device, as well as storage and data transfer for the treating physician. With the stationary charging bowl, the mobile case can be easily charged. While VMO is basically there as a rehabilitation and speech assistant for patients with lung diseases and used as a training program, Luca Nisi tried to do something different wih the COR, a product particularly for heart illnesses and thus making the life of patients with the teralogy of Fallot easier. The teralogy of Fallot (ToF) is the most frequent innate heart disease with approximately 600 cases per year, which constitutes 10% of all innate heart diseases. Symptoms of the ToF are for example a hole in the ventricle septum, a riding aorta, a narrowing of the lung artery or a muscle swelling in the right ventricle. 95 percent of all persons concerned die before their fortieth year of life. This results in a special requirement: no stigmatisation! Since the patients are very young, the device should strike the eyes of others as little as possible while they are at school, university or at work. Important for those patients is a continuous measurement of the vital parameters. With COR, the by Luca Nisi pursued In-Ear-Device, all substantial values – heart rate variability, blood pressure and the oxygen saturation in the blood can be measured efficiently. They determine the data with the cardiologists, that way the treating physician receives a comprehensive view of the condition of his patient. That way, the patient isn’t obligated to travel a long way or endure a bothersome latency for the aftercare. If the values are conspicuous, the treating physician will be able to organize them better in their context. 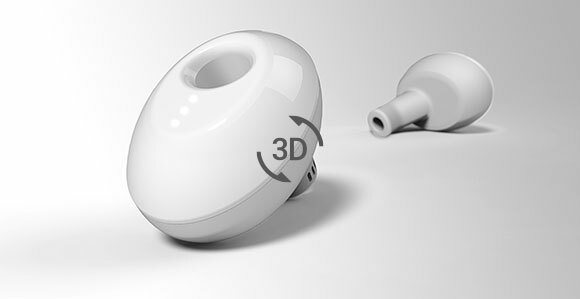 Both concepts were confronted with high requirements for the In-Ear-Wearables. 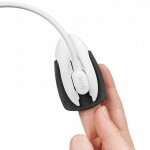 The product should be simply and stably fixated on the ear, so it won’t be lost during sportive activities. A high wearing comfort ensures the patient an optimal ergonomic adjustment and the use of soft materials avoids pressure marks on the skin. The product should also not get stuck in sweaters or a scarf. It should be easily usuable, but equally easily removeable. To avoid stigmatisation, it should be as subtle and inconspicuous as possible. The hearing function of the ear should remain as complete as possible. Likewise important for the design development: The device must communicate with a computer. Luca Nisi and Albert Ibragimov met all requirements with their different concepts. Although there are already bracelets or smartwatches which determine the vital parameter with the PPG procedure, the values of those products is very imprecise, since the wrist is not optimal for this kind of measurement and can easily be falsified by its strong variety of movements. Also towards already available products which measure with the PPG procedure at the ear, the concepts of our students had a crucial advantage: None of the currently existing products on the market allows to draw conclusions about the blood pressure and measures the values so precisely, as expected on the side of CiS. For the COR and VIMO target audiences these devices are thereby useless. Even though the “design freedom” was relatively low for those two students due to the extreme smallness and deployment location, the more impressive is the demarcation of those two concepts. Two possible concepts and shape directions are present, which can be further pursued and prepared now. Do the concepts also impress our cooperation partner CiS? We will report about the advancement of the project on this blog. We thank our junior designers for the interesting concepts!